This time it was Sarah who granted me permission to use an image. 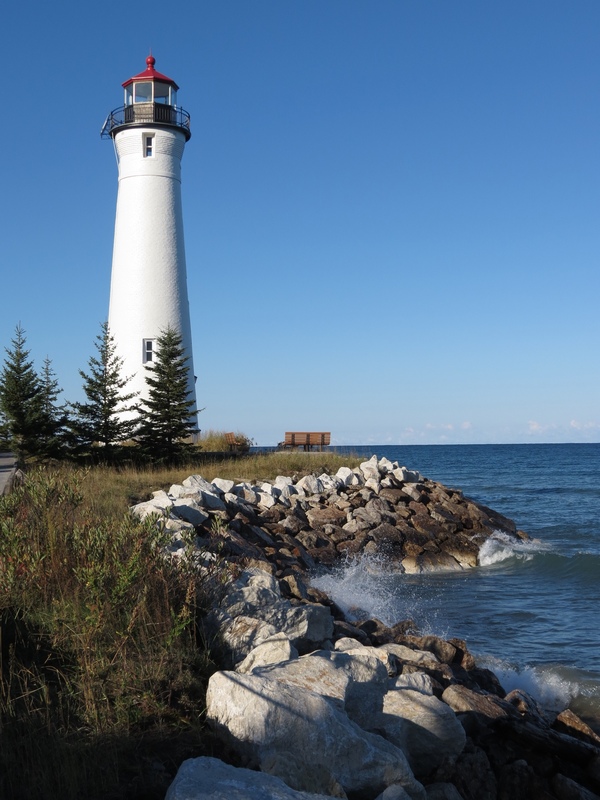 Following our amazing cyber connection forged by my photo of Crisp Point Lighthouse, her parish magazine is ready for distribution. 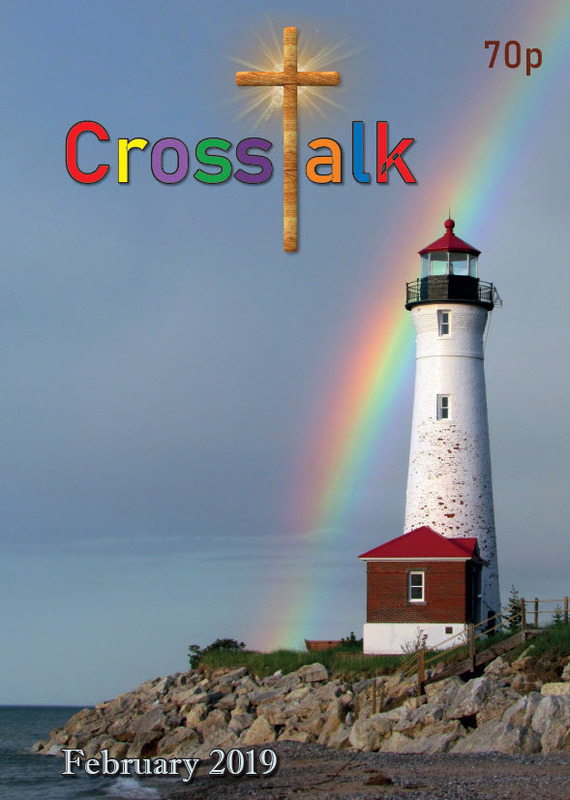 This weekend, Crosstalk – and Crisp Point Lighthouse – will be making its way into three Church of England parishes near Durham, England. In addition to the usual church news, promotions for upcoming events, schedule of services and useful contact information, it carries a wealth of stories, trivia and well researched facts centered on the theme of “Light.” This is more than your weekly church bulletin – it makes for great reading and even includes a recipe! No wonder this publication has won awards. As a writer for regional magazines, I am impressed and even more pleased to be a part of this issue. 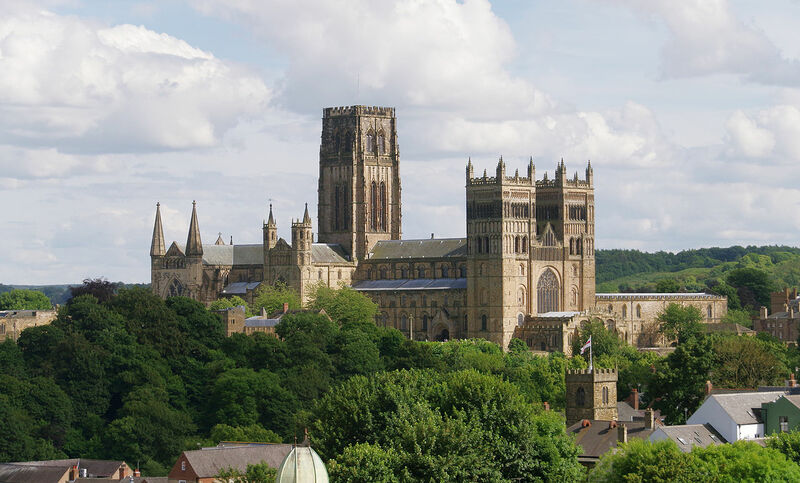 A return to Durham to meet Sarah just moved up my travel wish list. I hope that will be part of the rest of this story. The last sunrise. A final morning walk on the beach. A concluding entry in my journal. It is the last of five days that I will repeat this early routine. I will miss this place. As if to mark the occasion, sunrise is the most colorful of the week. I scamper to my favorite views to try and capture the image. Clouds light up from below as the sun advances up from the horizon. My walk takes the pace of a stroll across nature’s canvas. Tottering over mounds of Lake Superior rocks, I leave no trace. When the charcoal, gray, pink and white mosaic gives way to sandy beach I smile. Here I can walk more steadily, stop concentrating on where I place my feet and look around. I could pick up my pace, but there is too much to see. My footsteps from yesterday are still visible in places – a surprise on this windblown expanse. The afternoon’s visitors have also left their mark – bare feet, dog paws, a rock message composed on the sand. 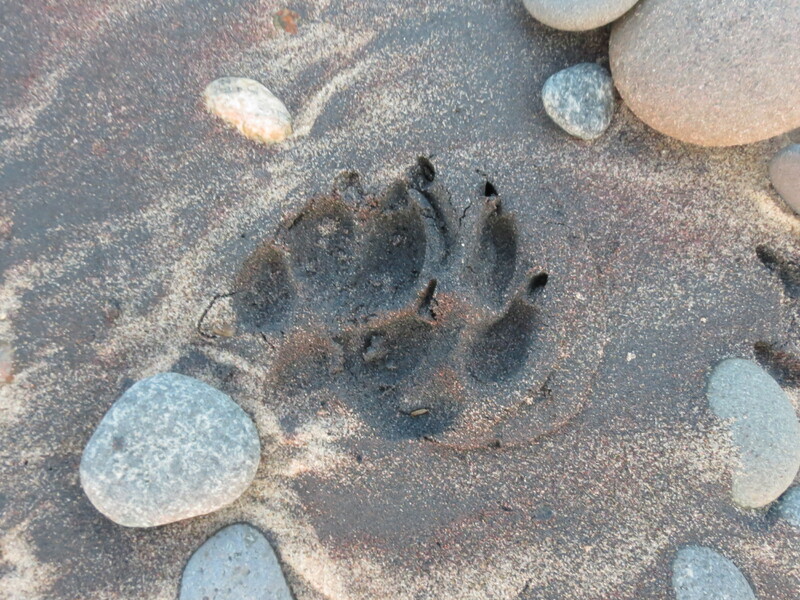 I wonder about the huge paw prints that walk alone, appear very recent. They could belong to a bear. It’s nature’s traces that are the real attraction. My favorite are the fine lines that curve and intersect on the firm sand. They mark the perimeter of the waves’ advances. they tell the story of the water’s movement. A few days ago big waves drove high up the beach. Today they merely lap the edge. Black sand stretches add to the design, mingling colors. Bird and critter tracks wind hither and yon though the sand. Drunken wanderings leave a fanciful path. Tiny feet press distinct prints. Animal friends join and leave. Explosions occasionally occur in the intersections of a crowd. The wind too participates in this artwork. Symmetrical ripples linger across the sand. A lazy stream creates similar patterns under water, on its journey to the lake. It is all there for the visual taking. The lake is quiet as my coffee and I settle down on my “writer’s log” on the beach. A light wind blows. Weak sunlight flows over my shoulders, tempered by broken clouds and remnants of wildfire smoke. The beach exudes calm. I don’t mind that it is not a sparkling blue day. This feels more relaxed. The air is that temperature that I don’t feel – it’s just there, comfortable. The day does not demand attention. It just is. 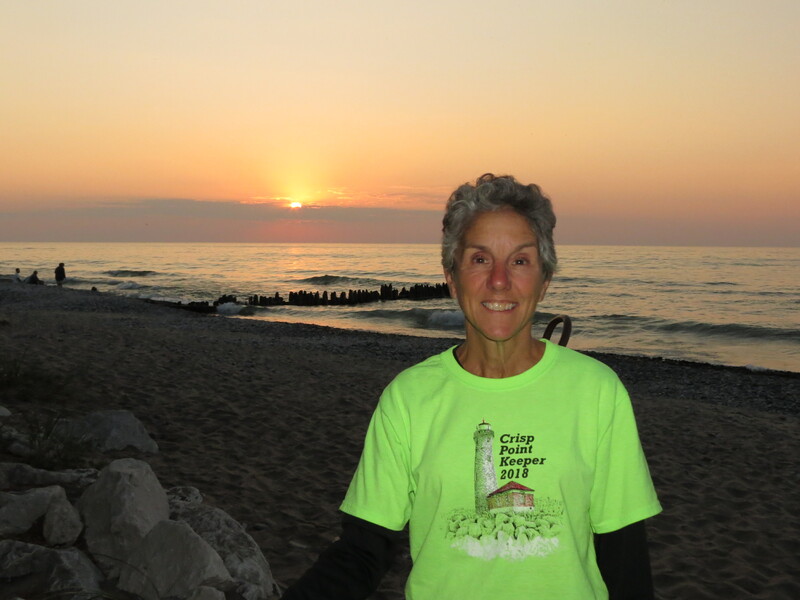 Soon the first visitors will arrive and I will resume my station in the Visitor Center for Crisp Point Lighthouse. During lulls in the day we will pack up our gear. Roll up the sleeping bags. Take down the tent. We will prepare to say our goodbyes to Crisp Point. For one more year. Living in the moment. 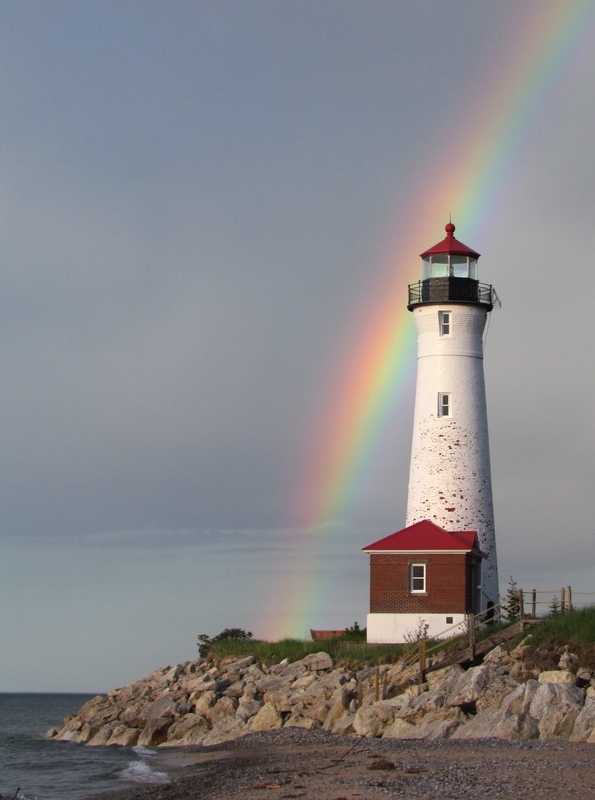 It’s what I crave most as we approach our stint as lighthouse keepers at Crisp Point Lighthouse. 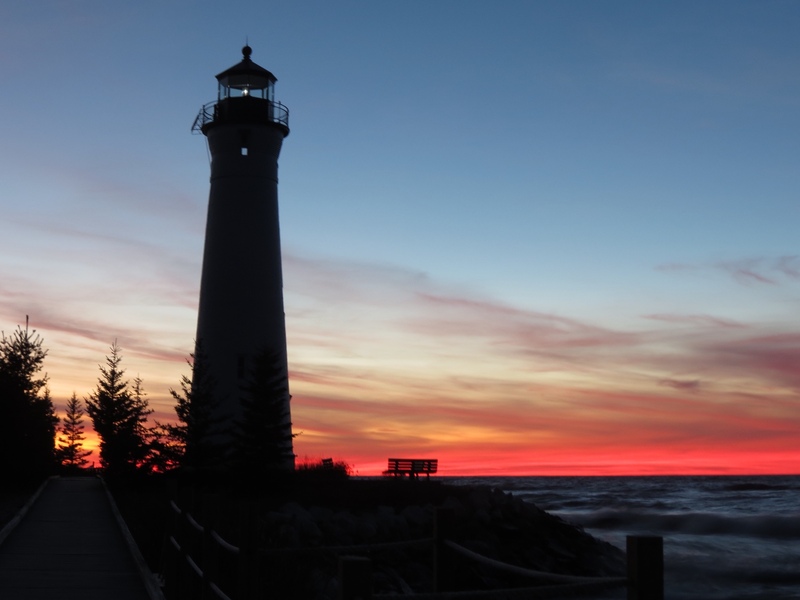 For five days, my daily life will revolved around my duties tending the lighthouse and its visitors. The rest of the world will live at a distance. The process begins as we drive down the rough 18 miles of dirt road. I leave civilization behind. The woods close in around the car. My cell signal dies out. I shut down my electronic devices for good. I abandon my to do lists, my deadlines, my schedules. Anything I don’t have in the car, I don’t need. Tent, sleeping bag, a duffle of clothes, cook stove, food supplies and water comprise my worldly goods. This is not new territory. Rich and I are in our fifth year as keepers, so we know the drill. 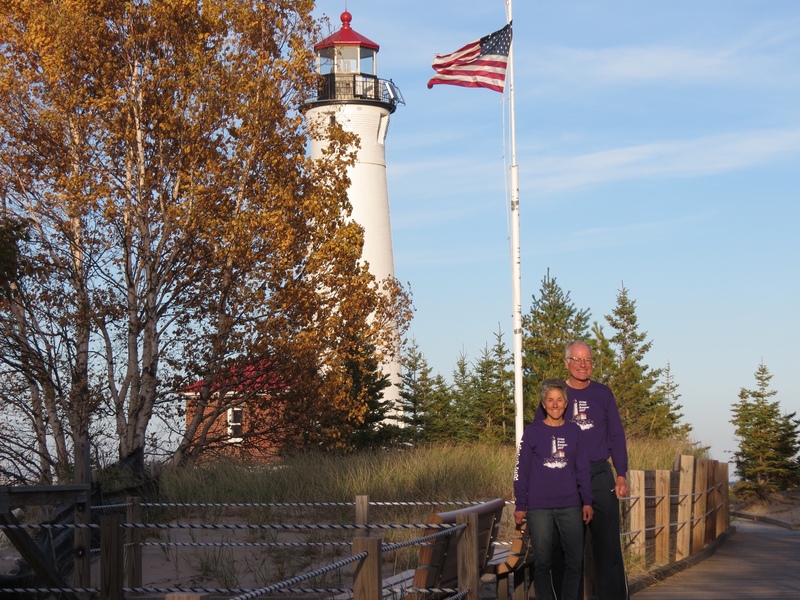 Our duties revolve around hosting the visitors who come, eager to see the lighthouse. We have already established camp in our keeper’s site before the first arrive. This is the first time we have been keepers in the peak of the summer season. Warm weather is a welcome change from our chilly October visits, and visitor numbers swell accordingly. We see close to 100 people a day, keeping us busy greeting, informing, helping and chatting with these visitors. I love seeing the eager faces, thrilled to know they can climb the tower, go out on the catwalk. From my post in the Visitor Center I meet people who have been coming here for years, decades some of them. They know more about the early days than I do, recount first hand stories of the decay followed by brilliant restoration. Despite being busy, it is restorative work. I have no need to plan my day. 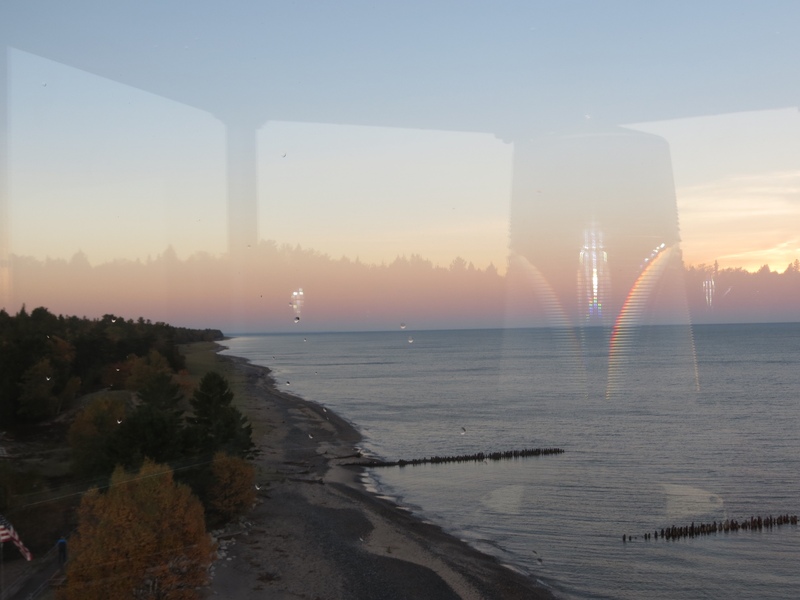 It develops with each person who arrives to see the lighthouse. It feels good. Serving others. There are always cleaning and maintenance jobs to be done and we fill in with those around our visitor duties. 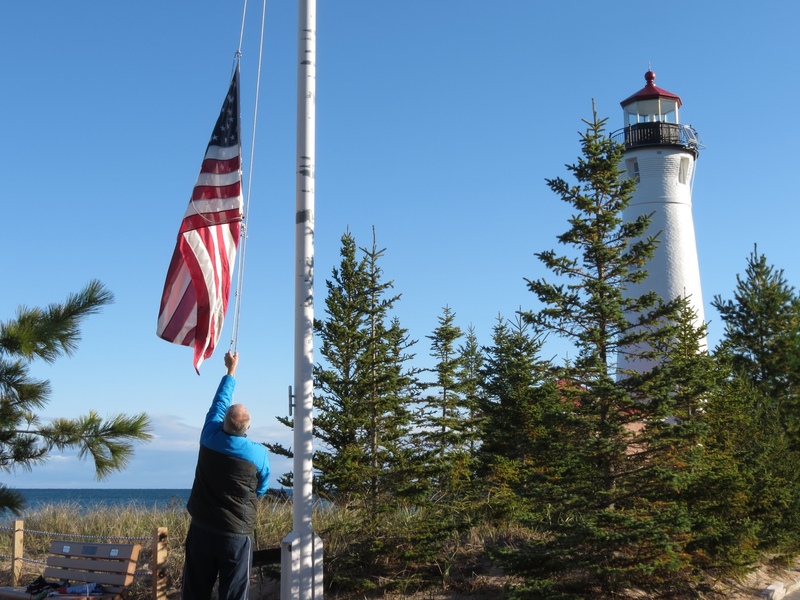 Rick Brockway, president of the Crisp Point Light Historical Society, comes daily and pitches in non-stop on chores. 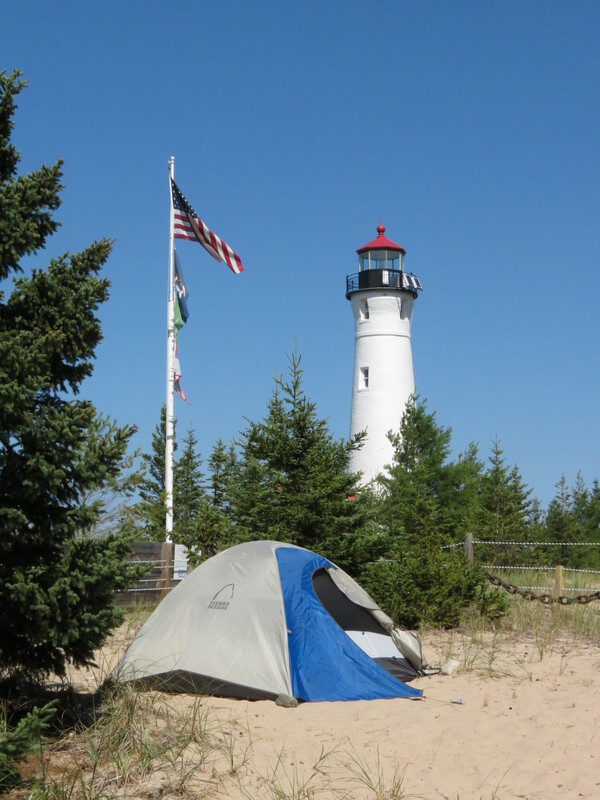 His tireless efforts make this lighthouse site worth the long arduous drive. 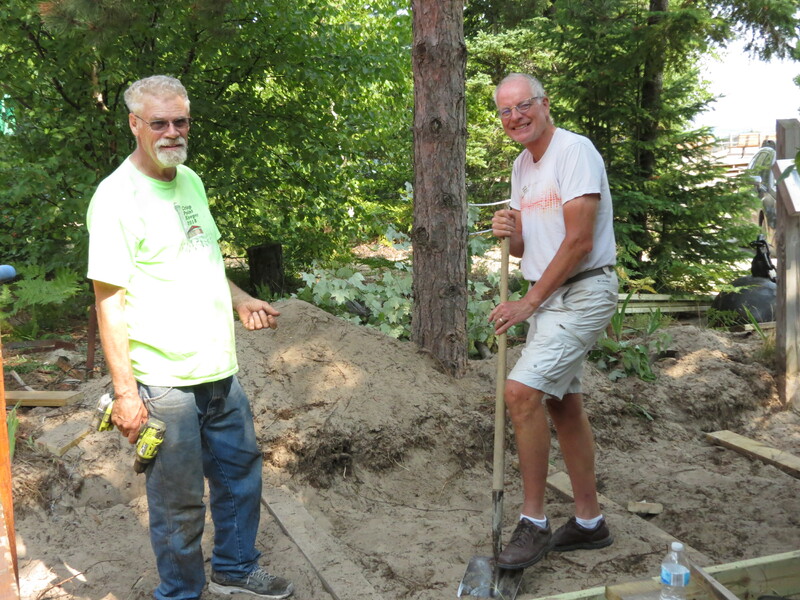 Rich helps out with replacing a segment of the boardwalk. I sort, fold and put away the new shipment of t-shirts that Rick brought. Our efforts pale in comparison to Rick’s dedication. It’s the edges of the day that I relish. Fringes of time to drink in the surroundings, revel in owning that remote space for a brief stint. 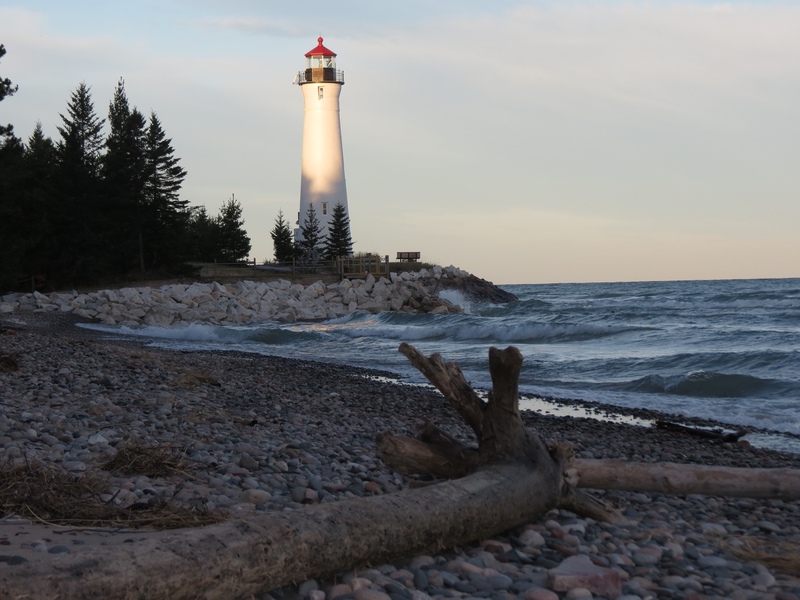 Nestled against the shore of Lake Superior, camping on the soft sand, hearing the repetitive lap or roar of the waves against the shore. Sunrise and sunset, that red orb rising and falling into the lake. The wood crackling as the campfire battles against the wind that whips away its flames as well as its heat. Post sunrise the sun paints the lighthouse with its magical morning glow. inching up the tower. The structure is illuminated rather than being the illuminator. Five days, living under the shadow of this lighthouse. It’s quite the life. What a difference a year makes. Last October we occupied this same spot, performed the same lightkeeping duties and camped in the same tent. But the similarities end there. Last year five days of mostly cloudy skies, a fair amount of rain and temperatures in the 40s left us shivering despite our winter jackets and long underwear. Our down sleeping bags were our saviors at night. Dark skies challenged the solar power system, which drained away from lack of sun and struggled to regain any power from dim bursts of sun. The challenges did not diminish our love for this gig, nor did it deter us from signing on for another year. But we felt rather foolish for choosing another stint in October. Fortunately, history did not repeat itself. Far from it. 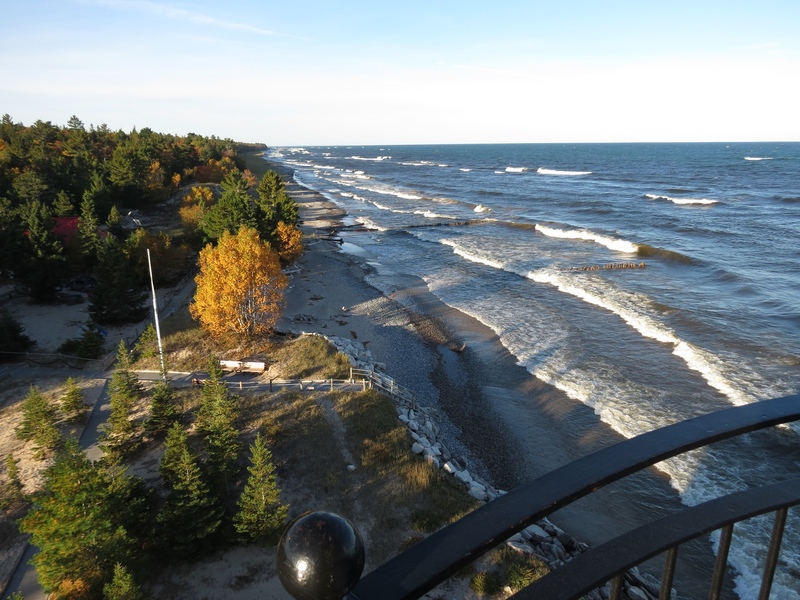 We have enjoyed five days of sunshine, moderate temperatures on the 50s-60s and Lake Superior in her finest blue. I happily resumed my early morning writing sessions on the beach. Our visitor count is up considerably over last year. We welcomed over 200 guests. All who come lend a new perspective. They hail from as far away as Wyoming and Beijing. Others have local ties and have been coming since before any restoration began in 1998. 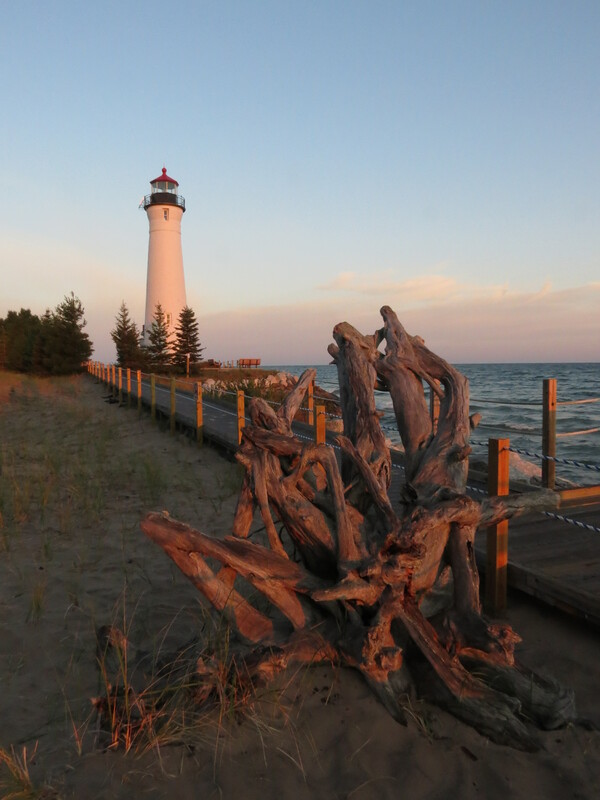 They know more of the lighthouse’s history than we do, and we love hearing their first-hand experiences. 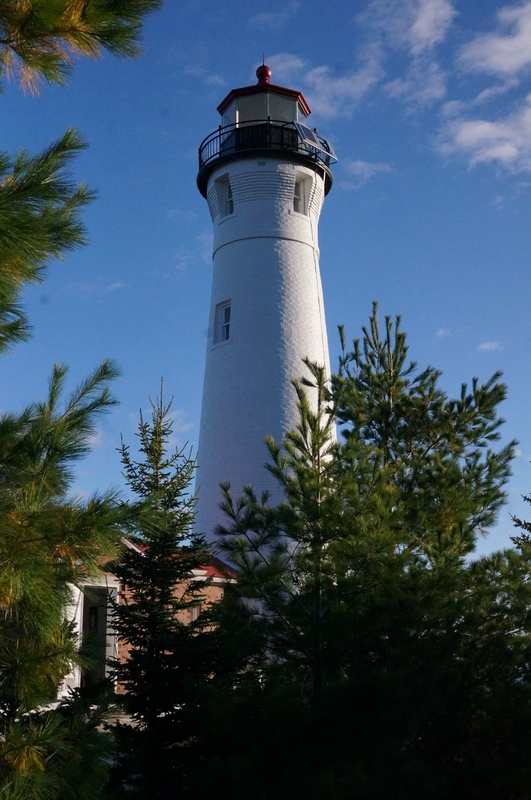 They especially appreciate all the work that the Crisp Point Light Historical Society has put into preserving and enhancing this site. Newcomers never fail to be impressed. Thinking that the week could not be more ideal, we are treated to a grand finale. We witness a deep pink sunset from the beach. We have the biggest blazing bonfire yet. Two classic ore boats parade by, illuminated stem to stern with white lights. 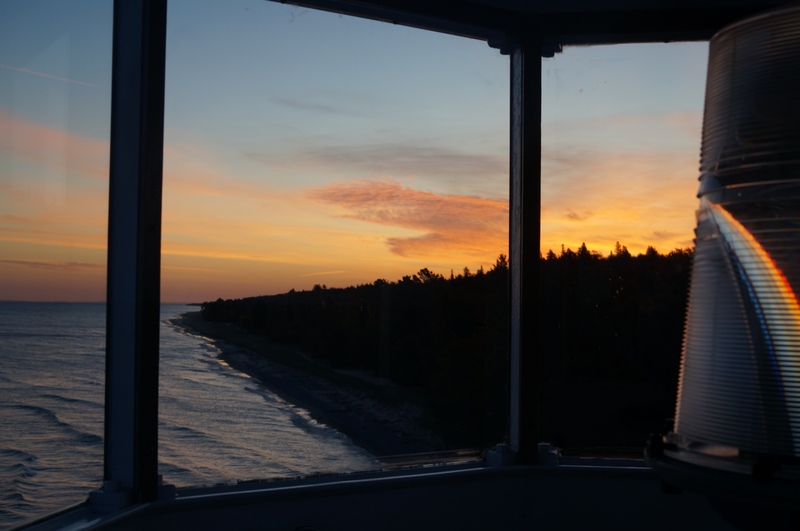 We watch a glowing sunrise from the lighthouse tower. And the day is balmy and warm. Suddenly October doesn’t feel like such a crazy choice. But just for kicks we signed up for August next year. Perched high above the shoreline I own the landscape. Lake Superior relinquished her pounding waves overnight leaving mere ripples on the surface and gentle pulses kissing the sand. Long shadows cross the beach and the neighboring trees are bathed in the glow of the low sun. The water’s sound competes only with the wind as it whistles through the open doors to the catwalk. Morning’s cool fresh air contrasts with the warmth of the sun on my back. 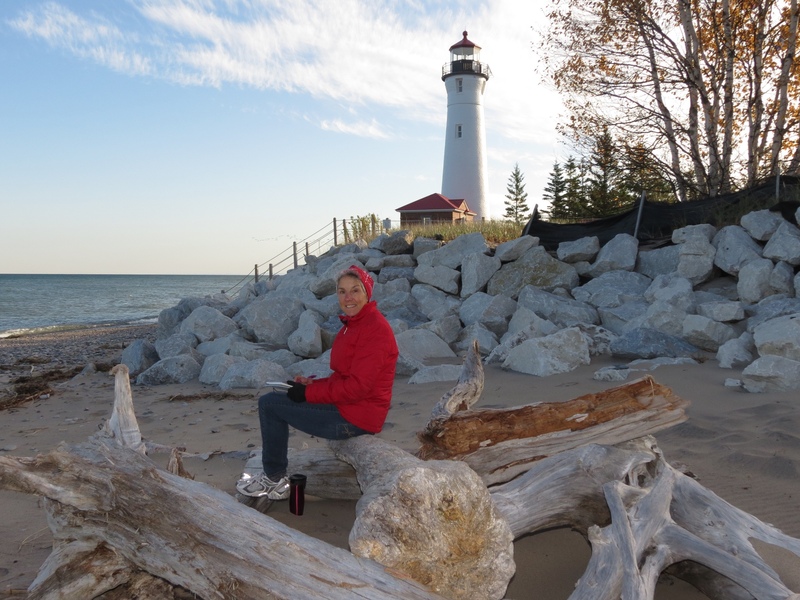 It is a rare privilege to claim a lighthouse for one’s own, even if only for five days. 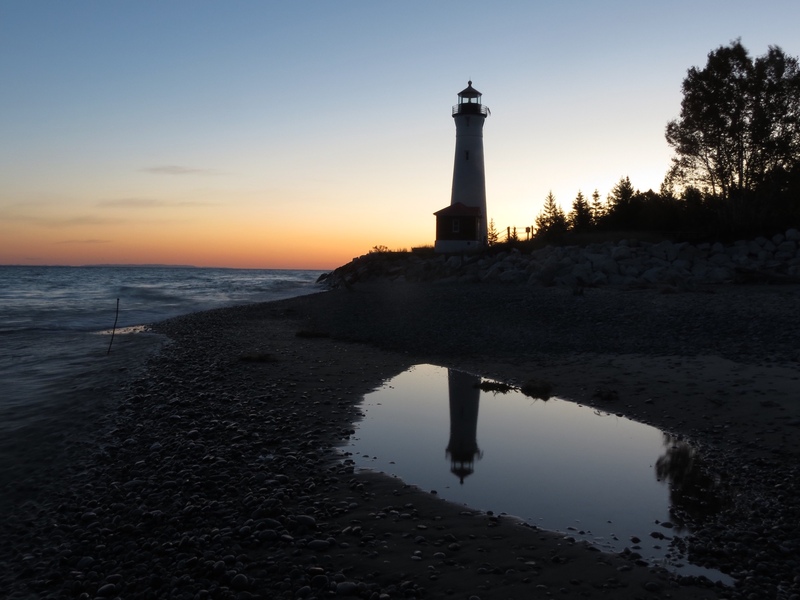 From 10am – 6pm we share this beauty with others seeking to explore her, acting as light keepers and welcoming visitors. But the early morning hours and evenings are ours. My morning began while the stars still dominated the sky. 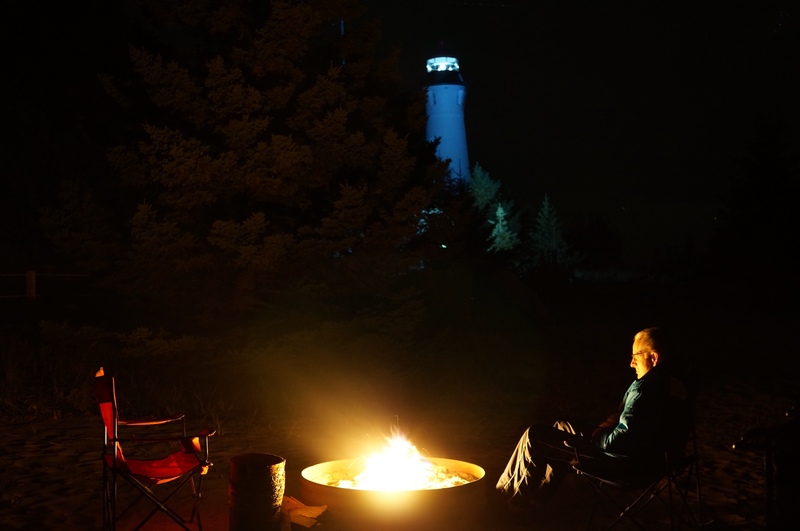 Emerging from our tent, wet with an overnight ground fog, the intermittent beam from the lighthouse was the only source of illumination. I could barely make out the rocks on the beach as I picked my way down the waterfront while the eastern skies took on their first rosy glow. On my return the orange hues crept up around the lighthouse to meet the velvety dark blue above. Walking the opposite side, I took in the handiwork of the lake, reconfiguring the shoreline even since last year. The high water level has eaten its way up into the dunes, carving off the front slope to reveal multi-colored sand strata in its new vertical edge. Once more my return yielded new views of the lighthouse. The sun embraced its red cap and glass face, walking gently down its elongated white body. Soon only the shadows of the nearest trees remained and stubbornly lingered. The morning’s light show complete, it is time for my final retreat. 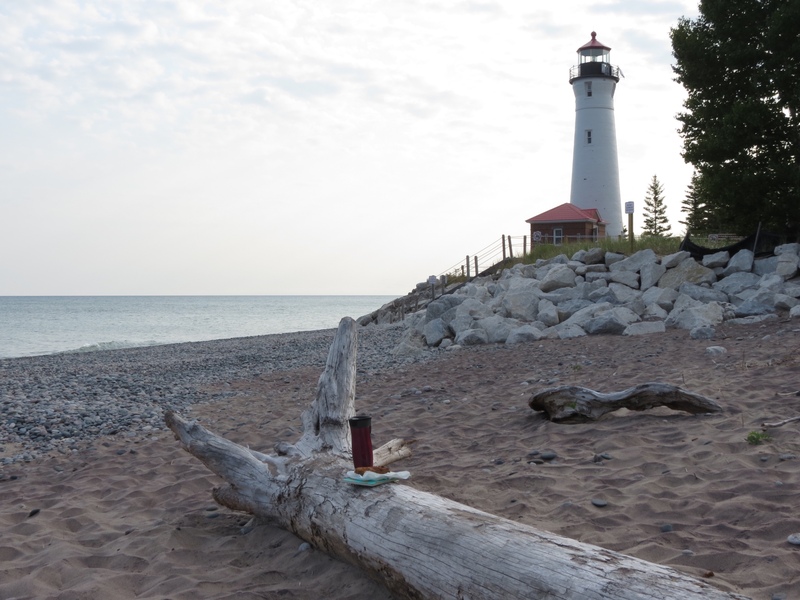 Ditching my usual spot on a driftwood seat on the beach, I climb the lighthouse, coffee mug in hand, writing tools at the ready. Here I sit, sheltered from the wind with the world at my feet. The moments are precious. I do not take my keeper’s privileges for granted. Soon I will relinquish my private haven – the public awaits. The road is a test. On a good day its 18 miles of dirt merely dissuade the meek. The bumps and sand require patience and slow travel. 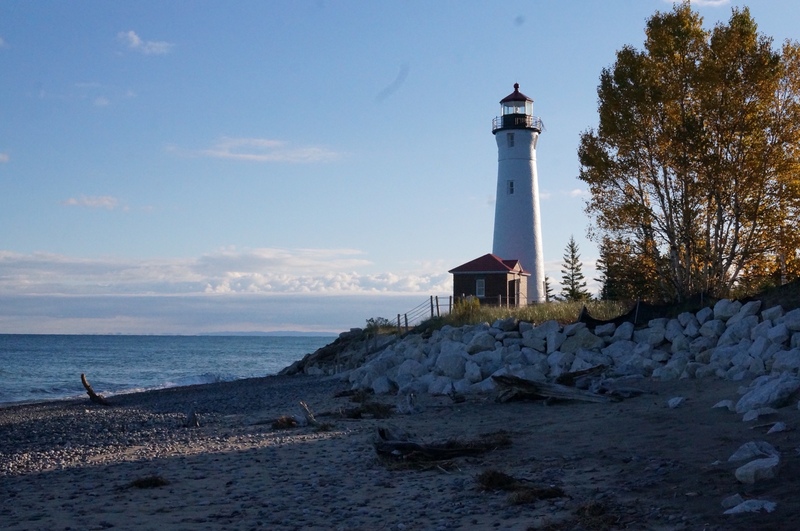 No one reaches Crisp Point Lighthouse by happenstance. You have to really want to come here. 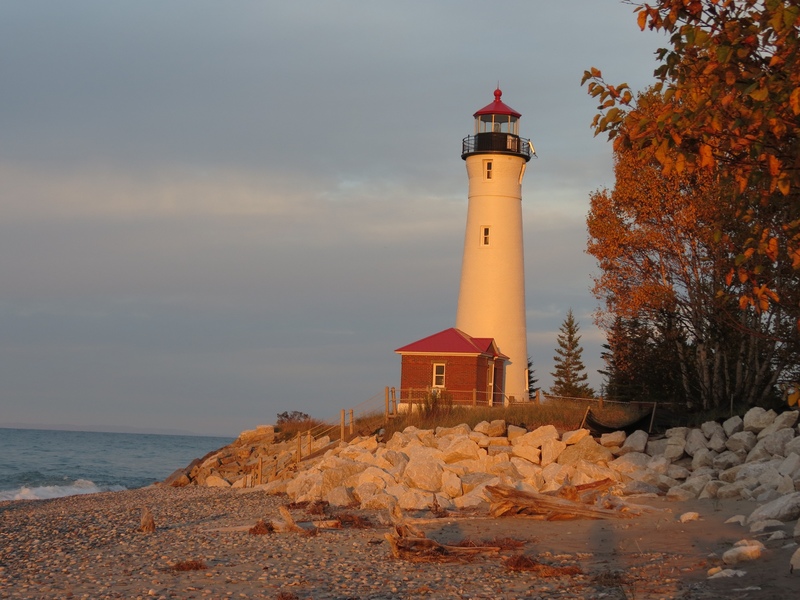 It is our fourth time returning to Crisp Point Lighthouse on the far western end of Lake Superior as volunteer lighthouse keepers. Arriving early in the morning for our five days of duty, the lighthouse greets us bathed in early morning sunlight. It is like seeing an old friend. Rapidly, before visitor hours begin, we reacquaint ourselves with every inch of the site. 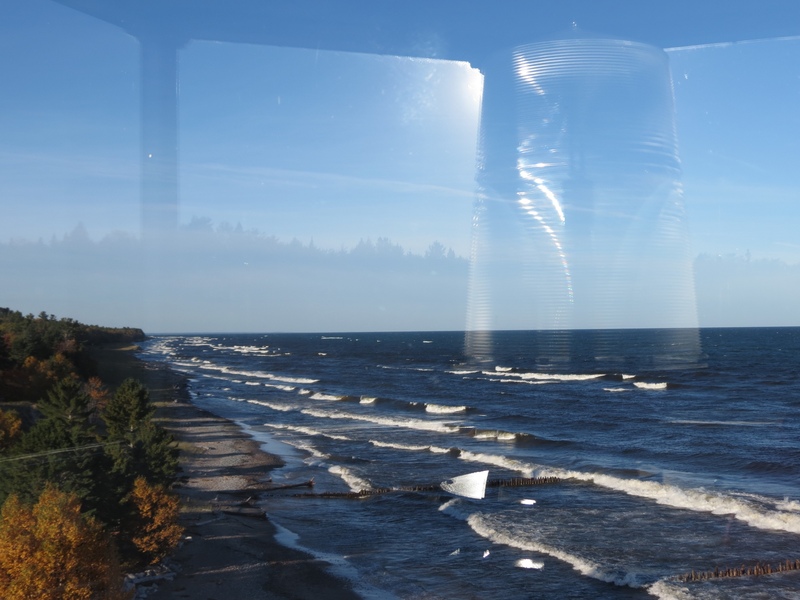 Lake Superior churns against the sandy pebbly shore. Remnants of the recent winds, the waves curl in white foamy regularity, its thunderous noise filling my ears. 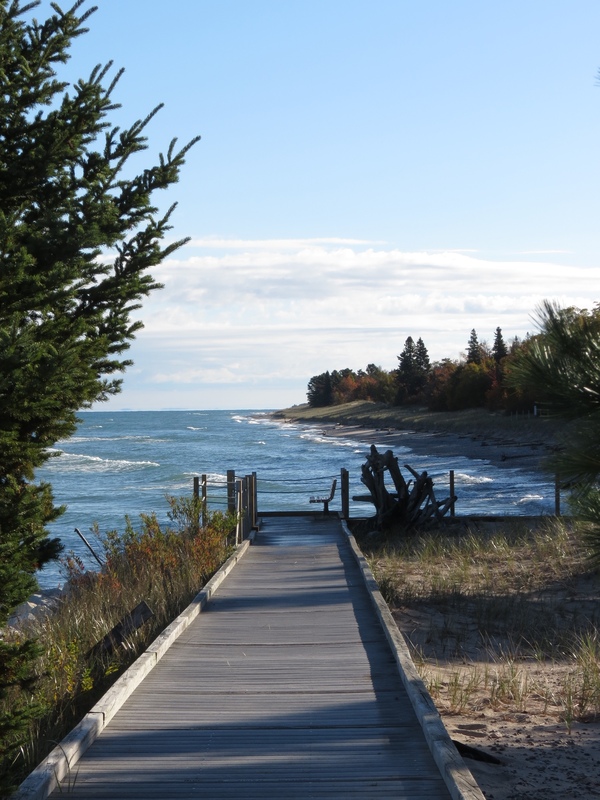 Fall colors are peaking; yellows and reds pierce the more prevalent pine landscape against the shore. The sun lends a welcome warmth to the near freezing air. Over it all towers the lighthouse. Freshly painted it stands determined against the shore, daring the waves that now crash at its base. Those waves have already eaten away 12 of the original 15 acres that once surrounded this light and buffered it from the greedy lake. 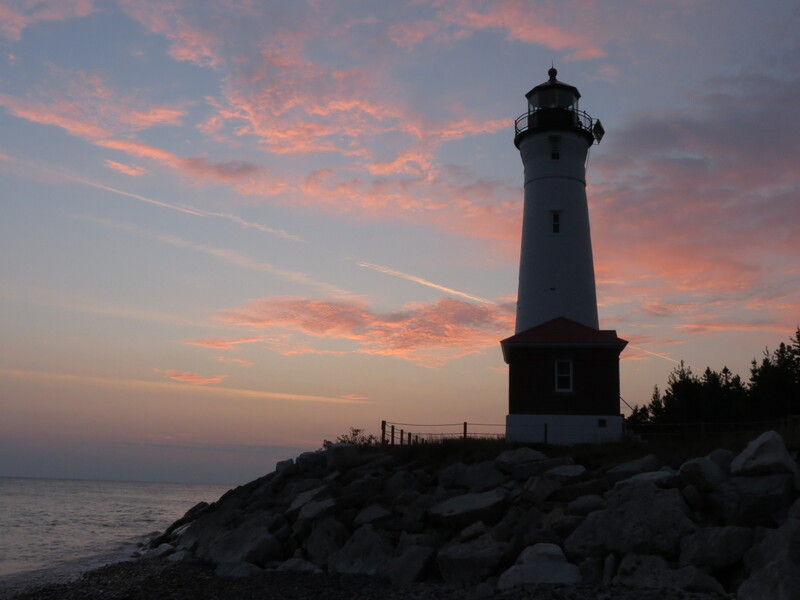 A new layer of boulders has been added to the line of defense, a constant battle waged by the dedicated volunteers of the Crisp Point Light Historical Society. Our campsite awaits, a single spot reserved for the keepers. 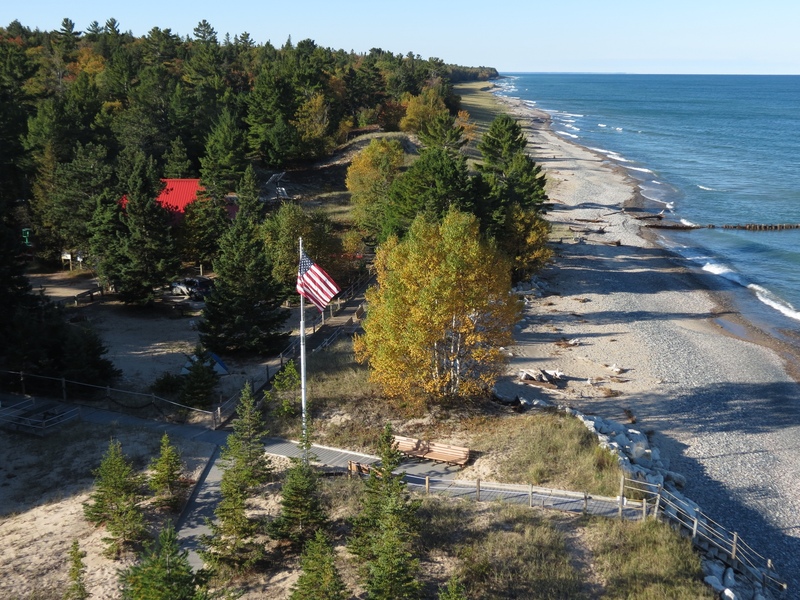 Our home away from home with all the amenities – sandy soft tent site, fire ring, barbecue grill, picnic table and Lake Superior views. Only the mud-caked car reminds us of our journey to get here. We aced that test and this is our reward.